•Admission for One into the Rock Around the Clock New Year's Eve Party at The Hard Rock Cafe at an early bird rate! •Admission for Two into the Rock Around the Clock New Year's Eve Party at The Hard Rock Cafe at a discounted price! •Admission for Four into the Rock Around the Clock New Year's Eve Party at The Hard Rock Cafe at a discounted price! •Groups of Two receive One Bottle of House Champagne. Tax and Gratuity are INCLUDED in price. •(1) Bottle of House Champagne. Tax and Gratuity are INCLUDED in price. Are you ready to celebrate your Chicago New Year’s Eve night until 4 in the morning? Hit up the Hard Rock Cafe this year for a New Year’s Eve celebration that you definitely don’t want to miss. Join all of Chicago’s partygoers as you celebrate your Chicago New Year’s Eve with top live DJs and the hits of the year. Take a look at this Chicago New Year’s Eve celebration and bring in 2019 with your friends right! 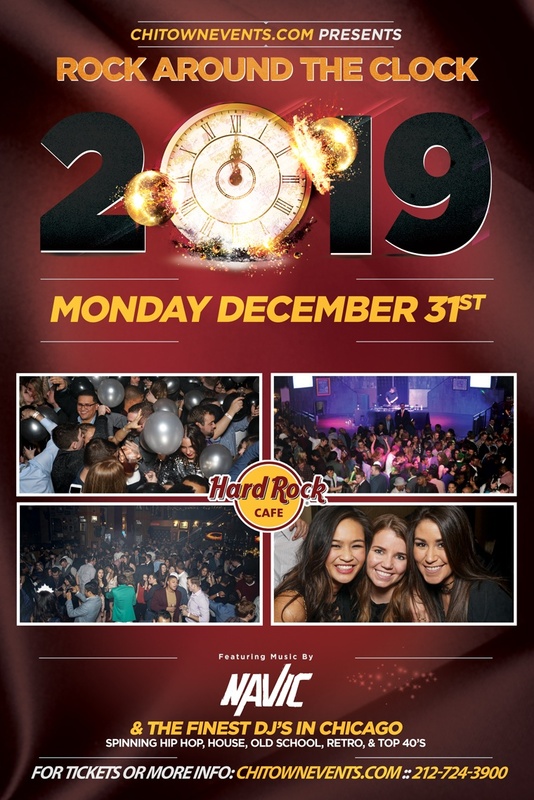 Bring in 2019 with over 650 guests as you party into the New Year at the iconic Hard Rock Cafe. This Chicago New Year’s Eve celebration will have you dancing to one of Chicago’s top DJs, DJ Metro. DJ Metro will be just one of the DJs mixing up the hits for the night. As you dance your way into 2019 with the Hip-Hop, House, Old School and even more hits, make sure you grab a couple bites to snack on. This Chicago New Year’s Eve celebration will have you enjoying appetizer buffet stations as you celebrate the night. Looking to get some drinks in to celebrate New Year’s Eve? The Hard Rock Cafe has got you covered! Sip on some drinks and enjoy a 4.5-hour premium cocktail reception to celebrate the New Year. Complimentary New Year’s Eve party favors will be available for you to enjoy as your DJ counts down the minutes to midnight. At midnight, cheers to the New Year with a champagne and keep the partying going all the way into the New Year! Looking to upgrade your New Year’s celebration? Throw in a VIP table package and add on bottle service to really make the celebration right! There’s only one Chicago New Year’s Eve party that will have you celebrating into the morning and that’s here at the Hard Rock Cafe. There’s no better place to ring in the New Year in Chicago than with this unforgettable New Year’s Eve party. Book your tickets today and make this Chicago New Year’s Eve celebration one to remember! Age Requirement: 21+ - Proper identification is needed to enter the venue.